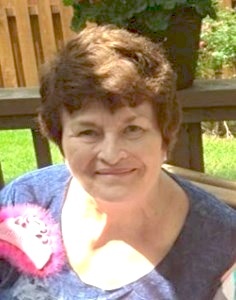 Patricia Ann Erck (Moore), 70, of Olathe, KS passed Mon. Sept. 19, 2016. Patricia was born June 6, 1946 in Pen Argyl, PA to Thomas and Mildred Moore. She graduated from Bangor High School in 1964 and married Herbert E. Erck July 31, 1965 in Bangor, PA. They moved their family to Olathe, KS in 1990. She loved her church, and was active in the Choir, and VBS. Her greatest joy was spending time with her family. She was preceded in death by her husband Herbert Erck in August of 2013, her parents and her nephew Todd Strohe. She is survived by her daughters Cheryl Pisciotta (Russ) of Lee’s Summit, MO and Michelle Brenizer (Scott) of Raymore, MO, grandchildren; John Stanks, and Charity Brenizer and her God Son Steven Stackhouse. Her sisters Carol Moore Strohe (Walt), Beverly Moore Stackhouse both of East Bangor, PA. Brother; Thomas C. Moore (Cathy) of Wind Gap, PA and many nieces and nephews. In lieu of flowers donations can be made to the Branches Church 13020 Blackbob Rd. Olathe, KS 66062.